Once traversed by Kawakawa and Lipan Apaches, the area is drained by the Nueces River, a disputed boundary between Texas and Mexico in the mid-19th century. The river now feeds the 21,000-acre Lake Corpus Christi, which is a major source of water for the City of Corpus Christi. In 1934 CCC Company 886 formed Camp Kleberg, named for local Congressman and King Ranch heir Richard Mifflin Kleberg. 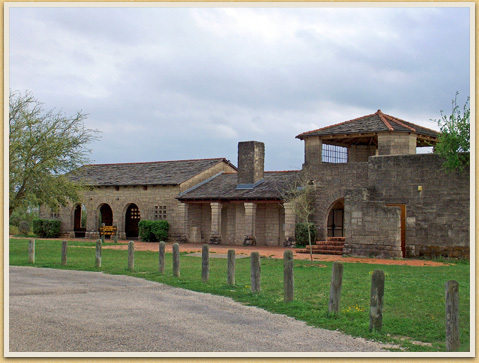 The enrollees remained at Lake Corpus Christi until transfer to Palmetto State Park in October 1936. The highlight of the 365-acre park is the refectory. It is here that architect Olin Boese, a National Park Service–funded architect working for the State Parks Board, designed one of the architectural gems of the state park system. Sited above a rocky peninsula and made of cast caliche block laid in random ashlar pattern, the open-air building includes a large terrace, pavilion, and stage. The building’s graceful arches and lookout tower provide a grand view of the lake and a cast-stone staircase leads from the refectory’s grounds down to trails along the lake. Refectory (currently the park headquarters) and Lookout Tower, Park Road 25, and Bridges. Two Boat Houses were designed, but only one was built, and it was lost to flooding. A Caretaker’s Compound and a Bath House were also designed but not built. A separate Caretaker’s Dwelling was constructed on the park, but has been lost due to park expansion and realignment of roads.